Whether you love it or loath it, find it a necessity or a burden, make-up is considered an important requirement for many women to feel good about themselves. For some, it can almost be considered a source of empowerment, giving women the confidence they need to face the challenges of the day ahead head on. For those, like me, who dread the thought of stepping foot outside the front door without the bare essentials, may be filled with a sense of anxiety at being seen bare-faced, even if it’s just to pop to the shops to pick up some groceries. OnePoll conducted a survey of 1,000 British adult women who wear make-up to find out what drives these women to go through their beauty rituals. With recent incidences of celebrities such as Alicia Keys, Kim Kardashian and Hillary Clinton appearing in public without make-up and other female celebs taking to Instagram to post their #NoMakeup selfies, understanding the push and pull factors of why some women feel it is essential to be made up may help break down these pressures and help liberate women from the beauty markets who feed off of women’s insecurities and fears of being bare faced. It seems that for many of us make-up wearers, we have that one essential item that we will apply before leaving home, no matter what. Of the women who wear make-up, a quarter said that the one item that they couldn’t leave the house without wearing was foundation. A fifth said they wouldn’t leave home without applying some mascara and 1 in 10 wouldn’t step outside without wearing lipstick. More than a quarter of the women surveyed said that they typically wear make-up seven days a week, although nearly half said that they had gone five or more consecutive days bare faced. But why is it so hard for some women to go fresh faced? One explanation could be the varying social situations women are faced with throughout the week. 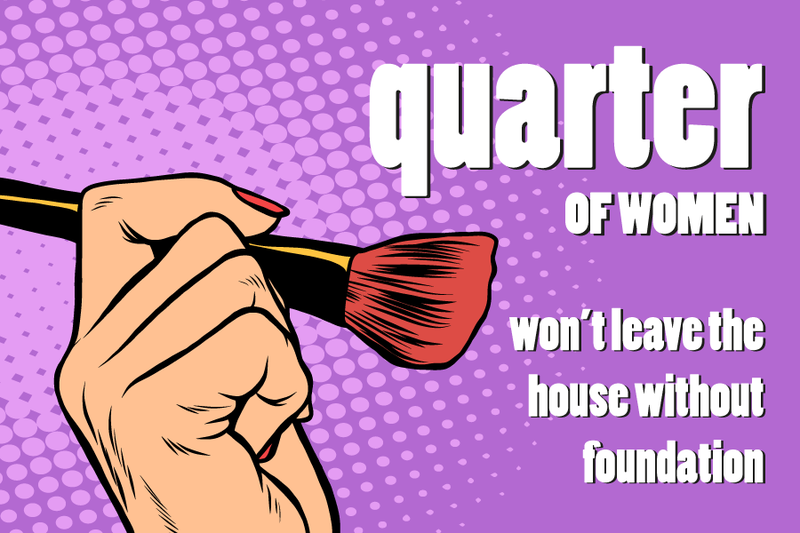 For example, the survey showed that women were 5 times more likely to always wear make-up to work than when staying at home and were at least twice as likely to always wear it when on a date or out with friends compared to popping out to the supermarket. Even so, 32% still said they would always wear make-up when going to the supermarket, and nearly 10% said they would always wear it even when at home. This suggests there is a degree of pressure for women to wear make-up. Whilst, overall 70% of the women polled said that they did not ever feel pressure to wear make-up, some did and this varied depending on where they were. For example, more than half of these women (56 %) said they felt a lot of pressure to wear make-up whilst on a date, 46% when out with friends, and 25% when at work. 10% felt a lot of pressure to wear it whilst at the supermarket and lastly, 2% felt a lot of pressure to wear it at home. –“[they] don’t look me in the eye”, “[they] don’t treat me with respect”. -Some said they were ignored or that they felt they were invisible. -Many said that people would comment and say that they looked tired or ill.
“People are more open with me, find me more approachable, less intimidating”. “People pay more attention to me, they listen to what I have to say, they’re more willing to help”. So exactly who is it that is putting these pressures on women? According to our survey, it mainly stemmed from the women themselves (67%), but there was also pressure from friends (42%), colleagues (29%), celebs (22%) and nearly one in five women reported the pressure was coming from their partner. Although the first time make-up free around a new partner may come with a sense of worry and fear that they may not find us as attractive, 84% of women in a relationship still believed that their partner does find them attractive (or would if they hadn’t yet taken the plunge). Make-up may be worn not only to make us feel good about ourselves and to appear physically attractive, but over time it may even form a part our identity. I know personally I feel a bit lost and uncertain of the face I see in the mirror if I haven’t gone through my usual routine, and for 42% of women, it was much the same. They agreed that make-up was to some extent a part of who they were. Furthermore, like the clothes we wear can help us feel physically and mentally dressed, the same may be said about make-up, as 47% of the women surveyed said they felt naked without make-up on. 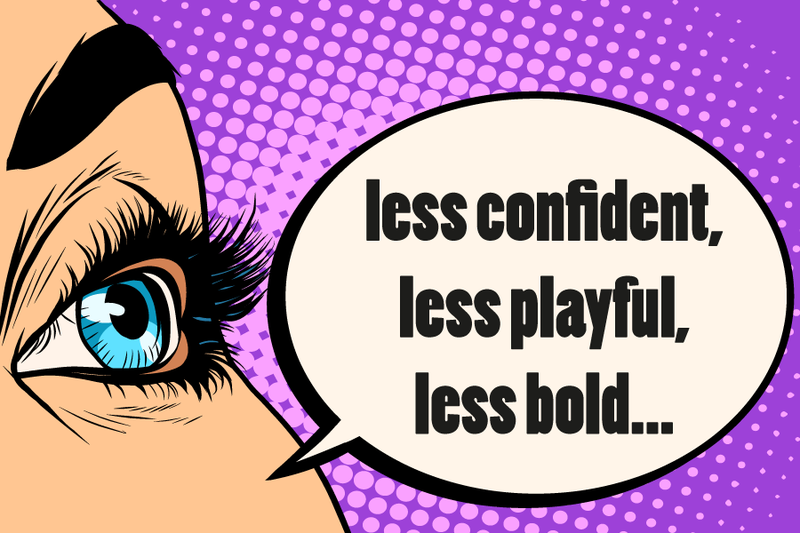 “less confident, less playful, less bold”. “…I feel liberated without make-up on. I do feel self-conscious when I first see other people but that feeling soon goes”. “(I) feel freer more like myself”. It seems then that for us make-up wearers it can be a useful tool to help us feel good about ourselves, feel attractive, and affect the way others treat us. However, as much as I’m one to feel uneasy about leaving the house without applying at least some make-up, perhaps we should embrace our natural beauty where we can let others see the real us. It may be scary but it can be good to have a bit of a ‘detox’, not only for our skin but also to help us re-engage with who we really are and see ourselves in the mirror with all the natural beauty we all already have. Even if it’s just when we’re at home, sometimes putting down the make-up for a bit can help us evaluate who we really are, for as the results suggest, make-up can even affect our personality and rather than hiding behind the promises that each make-up product holds, sometimes we just need to be our true selves.